Get back into action fast with our immediately available reconditioned cylinders. We stock a growing range of common cylinders found on Caterpillar dump trucks and dozers! Our Cylinder Service Exchange allows you to conveniently and economically replace your worn hydraulic cylinder without any major downtime and without having to carry your own spares inventory. We simply replace your worn cylinder with a one from our stocked range of fully-refurbished cylinders, thereby eliminating the need to wait for your worn cylinder to be repaired. Download our Cylinder Exchange brochure to see our list of cylinders in stock. Contact your local branch to place an order. When it comes to keeping your heavy earthmoving equipment moving, Berendsen is an obvious choice. 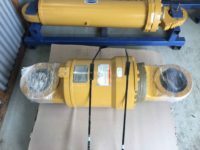 Berendsen has specialised in the refurbishment of hydraulic cylinders for over 25 years and has the facilities, equipment and experience to keep your heavy mobile equipment working at peak efficiency. Cylinders are first rigorously assessed, including bore, piston, gland and rod wear, crack detection, chrome hardness and thickness, and surface finish. Welding processes are then employed to reclaim worn clevis eyes, glands and other components before machining the part to original tolerances. Piston rods are hard chrome plated at our chrome plating facilities, whilst barrels are honed to original specified condition in our honing stations. Original spare parts and powerful assembly benches, equipped with hydraulic nut tensioning devises, are used to correctly assemble cylinders to required torque specifications. Cylinder integrity is verified on our purpose-built test rigs before painting to factory freshness in our in-house paint shops to complete the end-to-end restoration process.